Rated the duo of Jerome & Youssouf immensely seasons one & two, but we all know what has happened since they were split up & went to different clubs. Has to be said that putting aside the salary cap issues the fact that Popa let both go and they've not done much since then with the Roar or Perff shows TP's awareness of team dynamics and the importance of combinations. Your spot on about the value of the combination, With hersi and Polenz we killed teams down that side. This is what annoyed me most about the Perth salary cap rort. We largely had to give that up so we could keep under salary cap. Hersi signing for Perth "under" the gap set the alarm bells going for me. I'd take Polenz back, full back has been our biggest weakness this season. Not just defensively but so much of our attack came from full backs overlapping in s1 and s2. hersi's value was pressing when we don't have the ball He would do this amble round a few metres from the ball, then all of sudden bolt straight at the opposition player who was in possession. 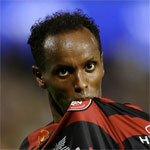 A lot of talk around about Hersi changing his social media images back to Wanderers gear. I wouldn't read into it any other than he is a free agent and can post whatever pics he likes for now. what if you want to look into it? Anyone know what he's been doing after his injury at Perth? Had a quick look online as I was organising these two videos and he looks to have dropped off the planet. Shame he's gone from rooster to feather duster in 1.5 seasons. Reckon popa should replay that ono cross to neville over and over until he picks it up? Reports on Fox Sports that he is about to sign with CCM. "So, Mr Charlesworth...my salary. Um, I asked the Wanderers for $500,000 and they..."
Call my cynical, but I suspect he's playing on minimum wages so he can qualify for Australian citizenship. 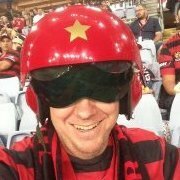 Amid the mooted hysteria of Luis Garcia's first A-League appearance for Central Coast, former Western Sydney fan favourite Youssouf Hersi will slip into Gosford for a medical. Hersi flies in from Holland on Sunday and, pending approval from club doctors, will sign with the Mariners until the end of this season with a view to stay longer. Chief executive Shaun Mielekamp said if all goes well he expects Hersi to be available for Saturday week's away match with Wellington. "We've got to go through the medical and get through that part, then we're currently working through until the back end of this season and potentially next season," Mielekamp told AAP. Hersi made his A-League name playing an integral role in the Wanderers' history-making inaugural season, though he was suspended for their grand final appearance. Mielekamp expected the 33-year-old winger to add valuable experience to coach Tony Walmsley's young squad, which will also benefit from the leadership of newly arrived former Liverpool star Garcia. The main concern would be whether he has fully recovered from the hamstring tear that hampered his time at Perth last season. Hersi has been training with a club in Holland since the Glory released him in May after only eight appearances.